I would have never thought that I would one day espouse the idea of examinations for the ballet students at my school. Certainly the studio in which I grew up, Maryland Youth Ballet, has produced dozens of professional dancers, and they never presented their students for exams. And weren't the students at my own studio thriving and going on to pursue their own careers without ever having taken an exam? I am far from the only studio director to have disregarded exams. Even as ballet exams are relatively common in Europe, especially at the world's major ballet schools with their own training systems in Russia (Vaganova), France (Paris Opera Ballet), Italy (Cecchetti), England (Royal Academy of Dance, also known as RAD), and Denmark (Royal Danish Ballet), most American ballet schools, which generally offer a potpourri of the above curriculums, do not offer graded evaluations to their students. An example of a typical American ballet teacher's reaction to exams can be found in my thoughts several years ago, when I witnessed Paris Opera Ballet School students prepare for their exams (a perk of being a former famous ballerina's business partner at the time). The students were going from one combination to another, which they had memorized. At the time, my thoughts were thus: Didn't we American ballet instructors need to keep our impatient students happy and their aversion to boredom at bay? And didn't American ballet students need more diversity in their ballet classes than simple preparation for an exam in order to be prepared for an American ballet company where they could be dancing a Petipa variation one minute and a Nacho Duato piece the next? This video shows young Vaganova Ballet Academy students' incredible clarity. Surely this type of regimented single-curriculum training system couldn't be possible in an American studio with varying body types and skill levels. Enter American Ballet Theatre's National Training Curriculum, which offered its inaugural training sessions to ABT alumni dancers in 2007. For the simple reason that ABT was my favorite company, I was curious enough to start to nibble on the ballet curriculum bullet. However, I never gave serious thought to presenting my students for exams, which were an optional part of the ABT training system. Well, at least not initially. Somewhere along the way of my year-and-a-half journey towards certification for all the Curriculum's levels, I realized that a great test of my merit as a teacher was not in passing the teacher exams (hard and stressful as they were) but in my students passing the student exams. But before I can tell you why I loved the results of the exam process, you should first know why I found aligning myself with a single curriculum was the oasis I never knew I needed in the director's desert known as Ballet School Land. •	As many ballet teachers are former or current professional dancers, each has individual preferences for steps. A systematic training system ensures that all skills are covered and presented at the right time of a student's physical development. Each skill builds one upon another, year after year, until the student, like a rollercoaster reaching the pinnacle of its long arduous climb, is set free to twist, turn and fly with coordination and technique intact. •	We dancers-turned-teachers also have individual preferences for dynamics. For example, I love to dance lyrically and my natural rhythm is in 3/4 timing. Yet, if I am to be a good instructor, I must be able to also feel comfortable giving many combinations in 2/4, 4/4, or 6/8 and know why it is necessary to do so. Each dynamic works muscles differently. •	We also have our own preference to style. Ideal training is devoid of any style other than pure, clean classicism. Just as learning good grammar enables a child to write in any genre, so too does learning the ABCs of ballet; proper Alignment, classical Body lines, and the basic rules of Coordination enable a student to grow into a dancer who can dance anything. •	Teaching ballet can feel like rocket science. Each student's body is different and a even a great teacher needs to constantly analyze and readjust corrections to find the perfect answer to a dancer's problem, or at least perfect for that day. A great training system gives tools, which uncover problems earlier. This means less time wasted flying by the seat of our teaching stretch pants. •	And most importantly, all of my ballet instructors, including me, are teaching the same things and have the same sensibility even as we communicate it in our own individual way. So, I became a believer in adhering to a curriculum. 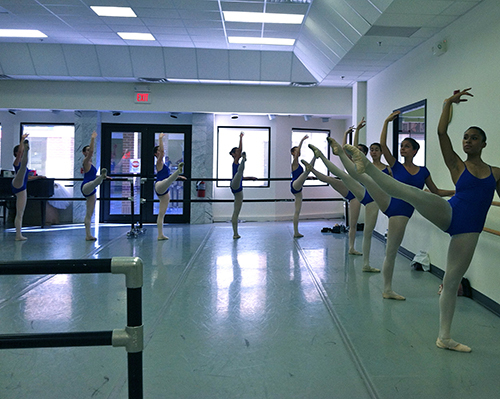 And as such, I began to feel that student exams would be a great experience for many of my studio's ballet students. The exams were not an easy sell to the students. Although some parents were thrilled to have proof that their children were learning what they were supposed to, some students and parents thought the entire process would be a waste of time. And who could blame them? In this era of protest against "teaching to the test," the last thing some of them wanted was class after class devoted to a ballet exam. Yet, it soon became clear to all of us that the exam classes, which are created by the individual instructors and not by ABT, encompassed all of what students needed at that particular time in their training. The almost daily work on the same class enabled the students to achieve clarity, strength and stamina. The classes included the entire curriculum for each level and were memorized by the students. This meant constant dancing -- as many as two hours worth of practically non-stop combinations. It took months for the instructor to build the class and longer for the dancers to gain the stamina to get through it. By the time the exam day finally arrived, each level had noticeably improved. The 11- and 12-year-old students were presented first, and they looked proud wearing their identifying number pinned to the front and back of their ABT uniforms. One by one they walked into the studio, bowed and introduced themselves to the examiner -- in our case the Curriculum's Director, Raymond Lukens. They took their places at the barre, and with only a few words from the instructor to cue each exercise, the students performed the class for which they had worked so hard. The second presenting class of 12- to14-year-olds produced near panic for me. This was the class that I was presenting, and every scribble Mr. Lukens made to his pad produced another shock wave of fear that I was kidding myself, that I was teaching them all wrong. Thankfully, I was put out of my misery as soon as class ended when Mr. Lukens gave me a quick positive feedback. Lastly, my school's most advanced dancers took the floor. Throughout their two-hour class, they were so together from the precise training that they could have rivaled any corps de ballet in clarity and synchronicity. And it was then that I realized that it wasn't the exam itself that mattered. It was the process of preparation that provided the dancers with all the reward they needed: exceptional improvement. Certainly using the curriculum had already made a big difference in the consistency of our instruction, but the exam gave the students purpose. When it was finally time for the advanced class reverance, the students' hard breathing filled the room like a hymn; their pinned numbers were either barely hanging on or had already disintegrated from their sweat. Just like my questioning of the value of ballet exams. What's keeping you from implementing a standard curriculum or giving your students exams? Did you have exams as a young dancer?